Looking for somewhere a bit different to visit in the North East? You could try out Cheeseburn Sculpture Gardens near Stamfordham in Northumberland about 10 miles west of Newcastle. Along narrow and winding country roads, you will find Cheeseburn. For those unaware, Cheeseburn encompasses Cheeseburn Grange Hall, a sprawling home with a rich and diverse history dating back to the 1200s; the magnificent sculpture gardens, which have been painstakingly restored to their former glory; the Chapel, which plays host to a range of artistic events, and the Stables Gallery, with its ever-changing programme of curated exhibitions. 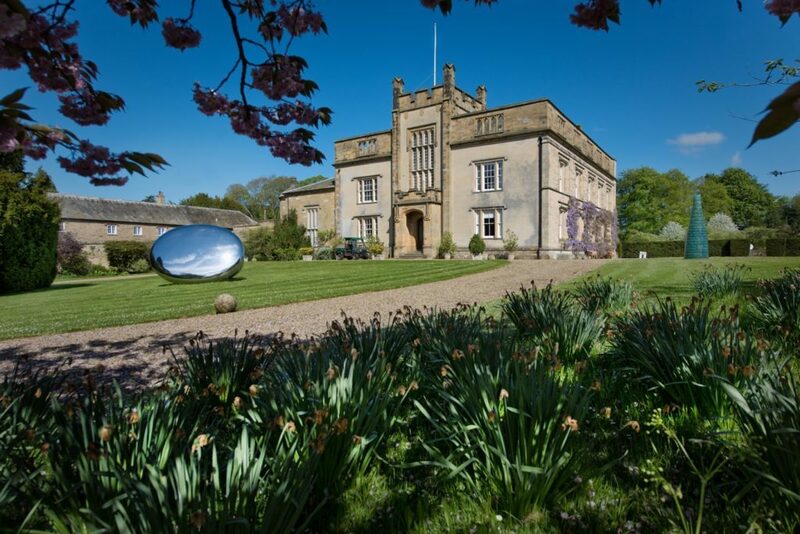 Founded by Joanna Riddell in 2014, Cheeseburn is open for six weekends a year, Cheeseburn is somewhat of a special occasion; tangible yet intangible, a visit to this magical venue is a memory to treasure. Each open weekend features a carefully-selected exhibition, alongside some sixty other sculptures situated within ten acres of landscaped gardens. Add to this the annual Gillian Dickinson North East Young Sculptor of the Year (GDNEYS) – an annual competition for emerging artists and sculptors to receive mentoring and career guidance, with one selected to deliver a £6,500 commission – and Cheeseburn makes for a wonderful day out in Northumberland. From talking to Cheeseburn’s curator, Matthew Jarratt, it’s clear that they are passionate about arts and culture. “At Cheeseburn, we love to offer sculptors at all stages of their career the opportunity to exhibit their work, as well as allowing them to experiment with new ideas,” Matthew notes, adding, “We hope to delight visitors, and challenge perceptions of what sculpture can be.” Past exhibitions at Cheeseburn are testament to that: from the spectacular stainless-steel sculptures of Chinese artist, Qi Yafeng to Joseph Hillier’s marrying of traditional techniques with modern technology. 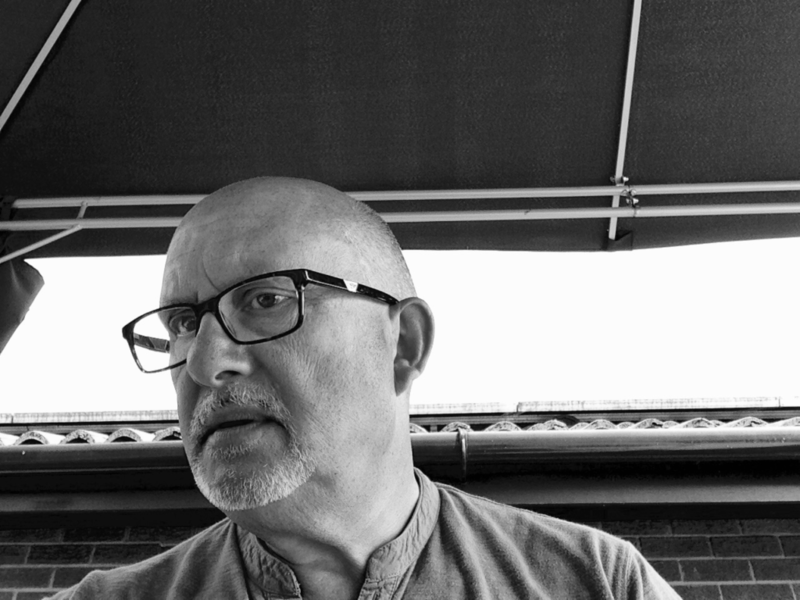 As part of our continuing series featuring creative people in the North East DAVID SIMPSON talks to 64 year old Peterlee-based watercolour artist, Stuart Fisher. Where in the North East are you based? Our home and studio in Peterlee. Tell us how you first started out as an artist? Thinking my job in architecture was at risk, I revisited painting, something that I hadn’t touched on since secondary school. In the late 1990s I produced a watercolour of a young colleague who had broken his neck in a competitive motocross competition. This helped to raise funds to assist with his drastically altered lifestyle as he was paralysed from the neck down. I doorstepped Dunlop, one of his sponsors and sold the original for £1,000 after which I raised a further £1,000 from the sale of prints. That same colleague remains a firm friend and incidentally, is an official mentor to the unfortunate victims of spinal injuries and those in the military who have suffered life-changing battlefield trauma. Following this I was invited to mount a solo exhibition in a gallery in Corbridge in 2000 and have exhibited almost every year since, turning professional in 2010 with the launch of my website. 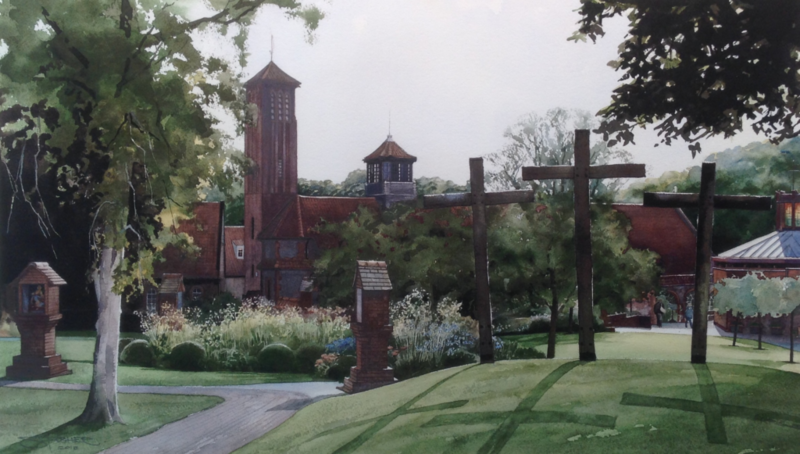 The commissioned painting depicting The Anglican Shrine of Our Lady of Walsingham in North Norfolk. It was a great honour to be invited to produce this work for a shrine of global importance to the Anglican Church and I was especially pleased to be invited to its official unveiling attended by The Shrine Guardians in March of this year. There’s potential in almost everything I see and hear. What influence if any does North East England have in inspiring your work? I don’t think that the North East is necessarily any more inspirational than any other region of Britain. That said, it is my base and as such has to be the source of my subject material. However with all my work, I attempt to add drama to subjects which have been done to death and which might otherwise be jaded to the eyes of the observer. What has been your most challenging creation? Watercolour is not a forgiving medium and as such many paintings have been consigned to the waste paper bin after hours of toil. There are new challenges to face in every painting. No matter how simple the subject may outwardly appear, there is always a hidden trap waiting to catch you out. The more you paint, the more you become aware of the potential pitfalls, the easier it gets. The recently completed commissioned painting for The Anglican Shrine of Our Lady of Walsingham had a number of challenges, very large size not the least of them. The fact that I’d never before attempted a garden of flowers was the most daunting aspect of the picture. I tiptoed around that section of the painting until I could no longer avoid diving in. Do you have any tips for up and coming artists? Be diligent, work hard and don’t expect art to make itself. Find one person you respect to critique your work, a person you can accept criticism from without being offended. Take inspiration from the greats and aim high. What other artists or photographers inspire you. During my early years in architecture, we received calendars at Christmas from local reps. The most sought after of these depicted the work of Sir William Russell Flint (1880-1969) a man who in my opinion is the Genius of the art of watercolour painting. Perhaps most famous for his depiction of scantly clad ladies peppering his architectural landscapes, his style inevitably went out of fashion in the 1960s. However subject matter aside, his technical ability was and in my mind still is, unsurpassed! Apart from continuous improvement, I’m not really sure. 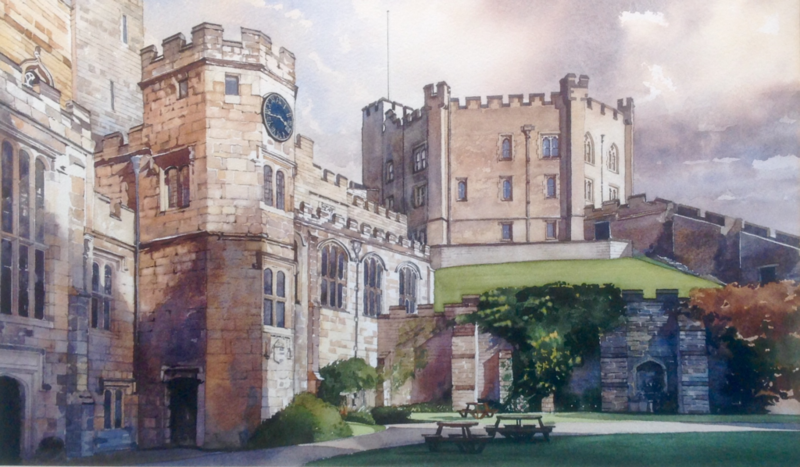 The 2016 commission to produce a painting of Durham Chorister School for its 600th anniversary is a past highlight. The then school Principal Yvette Day was recently appointed Head of Kings College Cambridge Chorister School. Without prior knowledge of the Chorister School building, the idea of eventually producing a portrait of such an iconic establishment definitely appeals.